Discover your wild backyard. Come take a slideshow trail tour around Seattle, Renton, Kent, and Vashon Island with award winning guidebook author Craig Romano. Urban Trails: Seattle focuses on the trails, parks, and preserves within and around the urban and suburban areas of Seattle and South King County. You’ll also find detailed trail information for Vashon Island’s beautiful parks and preserves in Urban Trails: Seattle. As I step through across the threshold of dirt into the embrace of the forest, sounds of passing cars and loud conversations begin to fade. A few steps further and the city noises have been forgotten. A robin sings a throaty song while a squirrel chitters its greetings and the stresses of the day melt away. I only have a few hours between work and the setting sun so heading into my beloved cascades isn't on the agenda. Instead, I head to one of many of the parks in Seattle for a short hike and a bit of relief. Looking for a quick hikes in the city? 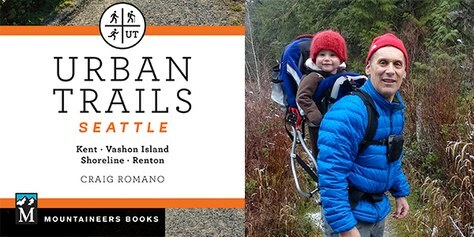 Award winning guidebook author Craig Romano is here to help you do just that with his latest book series on urban hikes. The Seattle Hiking Committee is excited to host Craig for an evening of discovering your wild backyard. On February 6, Craig will lead us on a slideshow tour around Seattle, Renton, Kent, and Vashon Island. He'll share details of our urban and suburban trails and parks close to home. Come explore old-growth forests, beaches, wetlands, historic sites, and other attractions on these trails perfect for a quick get-away. Please join us for an evening of exploration and stories.